Star of Bethlehem is also known as the Grass Lily or the Nap At Noon. 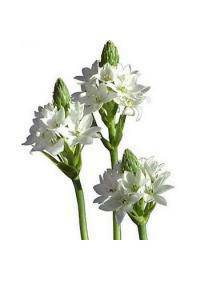 It is a bulbous perennial flower that produces small white blooms. It can spread quickly given the right conditions in a garden or lawn. This flower has many uses for landscaping or shady ground cover. It is also used for some cut flower bouquets due to its symbolism. Areas such as Fort Worth, TX, McAllen, TX, Roanoke, VA, Greensboro, NC, and South Gate, CA have been known to sell these flowers if special ordered. It can also be found growing wild near areas where it was once cultivated. Ornithogalum umbellatum is characterized by its delicate white blooms. The white petals are separated and form a star like appearance. The flowers typically appear in small clusters on each of the plants. The blooms open during the early morning hours and close by noon. This habit is what causes the nickname Nap By Noon that is used. The flowers are replaced by seed capsules after they have finished. Some Star of Bethlehem may have a green stripe on the backs of petals. The foliage is often stringy and has a lush grass like appearance. This appearance can cause it to appear as a weed in some landscapes. This species is also fairly aggressive in any habitat it grows in. Many plants can become choked out if it is left to grow unchecked. This can lead to large patches of it growing in meadows or roadsides. Sun requirements can be flexible depending on the species used. Some prefer more sun, such as partial and others may need full sun. Some of the species prefer partial or full shade or wooded areas. Moist conditions are often preferable, but soil must be well drained. Fertile and loamy conditions are the preference for best growth. Fertilizer may be used but it should be controlled to avoid excess. During winter and spring, watering is crucial to bloom development. The soil should not be allowed to fully dry out between watering. Many of the species are resistant to droughts during warmer months. Over time, dense colonies can form which may require thinning out. This makes it ideal as a ground cover in areas with partial shade. Some may choose to use this plant to cover ground under several trees. These can be used to create woodland gardens or a shady ground cover. They may also be grown in a container or a window box in the shade. Container gardens may become crowded too quickly if many are planted. This delicate flower is primarily used to symbolize hope in life. This may be applied to many situations and occasions for bouquets. The small star shaped blooms can be used in a number of arrangements. The white color is used to represent innocence, purity and honesty. White is also a popular choice for weddings and baby christenings. In some situations, the white flower can also represent chastity. Hope may be symbolized by adding this bloom to sympathy flowers. They may be part of a wildflower mixture or cut stems from a garden. Some may also use them in a live plant arrangement for a funeral. This bloom may also be used to symbolize forgiveness after a problem. Problems may include a conflict between spouses or between friends. Star of Bethlehem may also be added to anniversary arrangements.